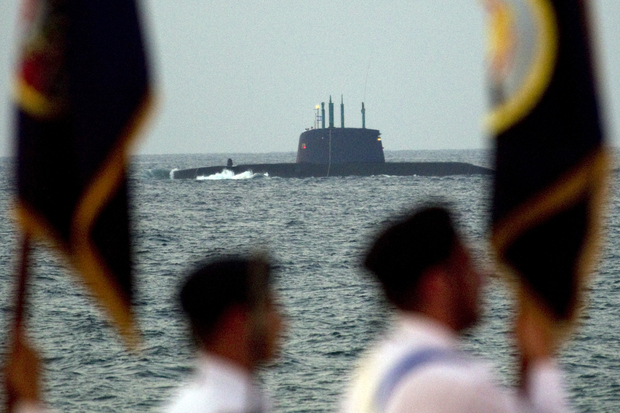 A German magazine is outraged at the nuclear refitting of German-made submarines in Israel. But as long as we’re willing to tolerate arms exports under the banner of realism, we have no reason to be upset. “Der Spiegel,” Germany’s largest weekly, had picked a potentially explosive topic for last week’s cover: Its lead article delved into the clandestine “Operation Samson,” a codename for the nuclear armament of Israeli submarines that were imported from (and partially financed by) Germany. As the German journalist Jakob Augstein wrote, “Der Spiegel” appeared to have uncovered the “atomic lie” of the German government, which usually remains silent when pressed about its arms exports to Israel. But is this really a newsworthy discovery? In the German newspaper “Der Tagesspiegel” Andrea Nüsse was quick to point out that Germany has been signing deals about submarine exports to Israel for twenty years – deals that have been supported by all major political parties. And the story doesn’t end when the subs leave their German dockyards. For years, security analysts and journalists have discussed the possibility (or, rather, the likelihood) of the nuclear capabilities of the Dolphin Class submarines. On May 10th, the Israeli newspaper “Haaretz” reported on speculations that the two newest submarines were equipped with torpedo tubes that could be refitted to carry nuclear-tipped missiles. In England, the “Sunday Times” discussed communications from the Israeli Defense Ministry, dating back to May 2010, that outlined the country’s defense strategy. According to the “Times,” at least one Dolphin Class submarine is supposed to be kept on alert at all times to be able to deliver a nuclear response to a strike against Israel. And as early as 2008, the American defense analyst Robert Windrem reported for NBC that “key to [Israel’s military strategy] is its nuclear-armed submarines. Israelis bought two Dolphin submarines from Germany in the 1990s (half paid for with U.S. funds) and modified them to carry nuclear-armed cruise missiles with ranges capable of striking any nation that could do it harm.” A report from the Council on Foreign Relations draws a similar conclusion. The fact that Israel has clandestinely amassed an arsenal of land- and sea-based nuclear weapons has been rumored and reported for so long that any denial from the German government would fail the simple test of plausibility. Hence, Berlin is doing what governments usually do in that situation: Keep quiet, and don’t make anything explicit. If we move away from the immediate Israeli context, Germany’s involvement with nuclear armament dates back a lot further. NATO’s “double track decision” from 1979 sanctioned the nuclear armament of Europe with American “Pershing II” missiles as part of a hemispheric defense shield against the Soviet Union. Germany’s government played along and became the host for one of the world’s most terrifying nuclear arsenals. Today’s passive toleration of Israel’s modification of German-produced submarines seems almost trivial by comparison. If anything, it would have been surprising to see the German government take action to explicitly prevent Israel from nuclear refitting of its submarines. It appears as if the staff of “Der Spiegel” is constantly oscillating between two different states of consciousness. On the one hand, we have a deeply realist view of the world: Israel and Germany are bound in a special historical relationship. Arms exports are an accepted component of foreign and economic policy. Use and abuse of weapons are not the responsibility of exporting countries but of those governments and armed forces that receive them. The realist observes and weighs different options without making categorical judgments. The other state of consciousness is that of hysteria. It emerges when the neat and tidy realism begins to rub against our moral convictions and intuitions. When we notice that established practices have very real consequences that can be pushed out of our daily consciousness but continue to have an impact. When we realize that the idea of Germany as an inherently “peaceful country” is as flawed as our commitment to rally against global injustices under the banner of “never again!” (and then witness the continuation of atrocities, again and again). When we have to confront the fact that the people of Tel Aviv and Gaza might share fears that transcend their mutual animosities: The fear of sudden terror, whether inflicted by shoulder-fired rockets or Israeli tanks, and the powerlessness of being caught in a maelstrom of cultural, religious, and nationalist frenzy. When we accept that the world is not black and white but comes in shades of gray, that is is complex and complicated and often rather dirty. When the historical dimension of the German-Israeli relationship created big taboos that cannot easily be untangled. The results of such hysteria are the shrill cries that echo from the cover page of Der Spiegel. If you don’t want to break eggs, don’t try to make omelets. Or, put differently: Those who accept the realist premise of arms exports must also be willing to accept that those weapons are not simply showcased during military parades and used as photo ops, but that they are deployed for the achievement of very concrete military goals. Sometimes, those goals might involve nuclear deterrence. And they must also accept that the idea of quid pro quo is baked deeply into the fabric of international diplomacy, and leave little room for moral or other forms of principled arguments. It is not surprising that the Wikileaks documents sent a shockwave through government agencies. Here, their inner workings were laid bare for everyone to see: a curious mix between gossip girl and Don Corleone. Journalists often struggle to convey the sense of complexity that exists and drives these developments. In seeking to explain the world, we look for narratives and interpretations that break complex circumstances down to a more manageable level and remove a good deal of ambiguity along the way. Two extremes emerge: The factual news report, and the poignant opinion article. Ideologies are stories we like to tell ourselves. That’s fine, as long as we remember that they are stories and not accurate representations of the world. When the story gets in the way of doing the right thing, there is something wrong with the story. The question that journalists are perpetually tasked with asking themselves is thus: Are the stories we write really a reflection of reality? And how do they help us to cope with, and act in, the world as it exists? Germany exports weapons to many countries and regions that fail to meet the standards of a decent, peaceful, and democratic society. We produce and export weapons that are used to kill internal and external enemies, or uphold a fragile peace by way of deterrence. We are deeply implicated in the global political game with all its bright sides and shadows. We may ask ourselves: What consequences are we willing to accept, as a nation, as voters, as individuals? And what are the criteria upon which we base our judgments? What forms of collaboration and solidarity with other countries are we willing to accept? What is the role we want Germany to play in the world? Neither of those questions will be answered by retreating to hysteria. As long as we’re willing to ship weapons around the globe, we have to be ready to face the consequences of those exports.